what your hair would look like if you put too much product in it? While I was folding clothes in the hallway, Sophie came by looking for Emma. I said Emma was in my bathroom, so away she went to find her big sister. I finished folding the clothes, went downstairs to make a bottle, and then came back upstairs to make sure everyone had brushed their teeth. The older 3 were playing happily in their bedrooms, but where was Sophie? I went into my bedroom to see what she was doing, where I smelled an interesting smell, and came into the bathroom to find the crime in progress! 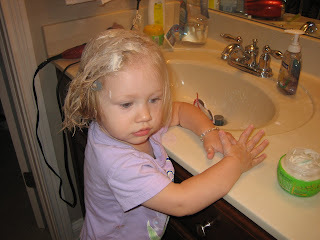 She had somehow gotten the lid off our Surf Hair goop, and was smoothing it throughout her hair, quite proud of herself. When I came back after getting the camera, all 3 of the older kids were in the bathroom laughing at her, and she felt a little bad about that, so she wouldn't smile for me. A quick bath and now she is all clean. I am quite relieved it wasn't shampoo she had gotten into, which was my thought when I first saw her. It would have been much harder to clean off the counters! Love the cute girl in all the goop! How cute! I am starting to notice that kids can get into things really fast. I guess I better keep that in mind for whenever some of my own start coming around. I remember when Joseph walked out of the bathroom with baby shampoo streaming down from the top of his head. No tears, but he was happy to get it washed off. The shampoo didn't come off as easily from the carpet! Too cute. I love her little arms with the elbow dimple in them - they are so "gushable" at this age, even when they make messes. This little girl is tooooo cute even when she makes messes. I am sure she thought she looked beautiful. I remember when Bob was about her age and I had some desiten in the bathroom. He applied liberal amounts to his hair and rubbed it in well. Believe me it is next to impossible to get out. I washed it and did everything I knew what to do but ended up getting his hair cut and then someone told me to apply baby oil. It worked. Oh the things these little ones can get into. oh dear. what a sweet girl. :) i'm glad you got a picture and that it wasn't too hard to clean up.